b) Fulfillment of legal obligations (article 6, paragraph (b) of the Law of Personal Data Protection and article 6, n. º 1, paragraph (c) of Regulation (EU) no. 2016/679, of April 27, 2016), for the fulfillment of legal obligations established by the national law, and European laws or regulations. Work Planning and Support of Management Decisions and Market Strategies. The provision of personal data for the processing purposes mentioned above is optional, but necessary, to the extent that the failure to provide them implies the impossibility of registration and use of the website. The asterisk in the registration form identifies the personal data necessary for the execution of the purposes of the processing described in paragraph 1. With the express, free and informed consent of the user, some personal data of the user (first name, last name, email, address, and telephone number- landline and mobile) may also be processed by PACSIS for marketing purposes (direct sales, sending of promotional material and commercial communication), or for PACSIS to be able to contact the User through e-mail to suggest the purchase of products and/or services offered by the PACSIS and/or by third parties, to present offers, promotions, or business opportunities. The consent for the processing of data for such purposes is free and optional. If the consent has been given, the User may revoke the same at any time through communication to PACSIS, and for all intents and purposes using the methods specified in paragraph 7 of this policy. The User can also exercise the right of opposition to the sending of commercial communications (by e-mail) by clicking on the specific link to revocation of consent, which is included in all marketing e-mails. If the consent has been revoked, the PACSIS may send an e-mail to the User to confirm the effective revocation of consent. PACSIS hereby informs that, following the exercise of the right of opposition to the sending of commercial communications, the User may continue to receive marketing messages due to technical issues (for example, marketing messages prepared just prior to the exercise of the right of opposition). If you continue to receive marketing communications within 72 hours of the exercise of the right of opposition, PACSIS requests that the situation be immediately reported, using, to do so, the contacts specified in paragraph 7 of this policy. The treatment of the personal data of the users will run automated and manually by computer tools, applying logics strictly related to the purposes and, in any case, ensuring the security and confidentiality of personal data. The employees of PACSIS appointed to manage the personal data may access to the personal data of the Users. Those employees appointed by the PACSIS as ‘people responsible for the processing’ will treat the personal data of the Users exclusively for the purposes specified in the terms of this policy and in strict compliance with the Law of Protection of Personal Data and Regulation (EU) no. 2016/679, of April 27, 2016. The third parties who may process personal data on behalf of PACSIS, may also access the personal data of the Users on the quality of subcontractors, such as, including, without limitation, providers of IT services necessary for the operation of the website, providers of outsourcing services or cloud computing services, professionals and consultants, or platform-responsible for sending marketing emails on behalf of PACSIS. PACSIS may share your data with third parties for the accomplishment of marketing initiatives and advertising, ensuring that all third parties involved in the process of data treatment are committed to comply with and respect the provisions of the Law of Protection of Personal Data and Regulation (EU) no. 2016/679, of April 27, 2016. Please be advised that, in fulfillment of legal and/or contractual obligations, personal data may also be transmitted to the judicial, administrative, supervisory or regulatory authorities and also to entities that perform, lawfully, actions of data collection, actions of prevention and fight against fraud, market or statistics studies. Users have the right to obtain a complete and updated list of subcontractors (if any) appointed by PACSIS, and, to do so, must send a specific request to PACSIS under the terms specified in paragraph 7 of this policy. In accordance with article 10 of the Law 67/98, of October26, and article 12 of Regulation (EU) no. 2016/679, of April 27, 2016, PACSIS informs that users have the right to obtain information about (i) the identity of the person responsible for the processing and, if applicable, of his representative; (ii) the purposes of the processing, (iii) the recipients or categories of recipients of the data, (iv) the voluntary or mandatory nature of the response, as well as the possible consequences of not responding, and (v) the existence and the conditions of the right of access and rectification, provided that they are necessary, taking into account the specific circumstances of the collection of the data, to ensure to its holder a fair processing in respect of the same. In addition, PACSIS informs the data subjects that they have the right to: a) update, rectify or, when interested, to require the integration of data; b) deletion, anonymisation or blocking of personal data that have been processed unlawfully, including personal data whose retention is not necessary for the purposes for which it has been collected and therefore to be treated; (c) the certification that the operations performed in accordance with the letters a) and b) have been notified, as also related to their contents, to the entities to whom or which the data were communicated to or disseminated, unless this requirement proves itself to be impossible or involves an effort manifestly disproportionate compared with the right that must be protected. Users have the right to object, in whole or in part: a) for legitimate reasons, to the processing of their personal data, even if they are relevant to the purposes of collection; (b) to the processing of personal data for purposes of sending promotional material, direct sales or for carrying out Market surveys or commercial communication. Users may exercise their rights upon the contact with PACSIS through the following methods: (i) sending a registered letter with acknowledgment of receipt to the indicated address of PACSIS, (ii) sending of electronic mail to the mailbox apoio.cliente@pacsis.com. PACSIS Iberia. S.L. con sede en el Paseo de la Castellana 118, 7B, Madrid, y con NIF B-86679321 (en adelante "PACSIS"), responsable del sitio web www.pacsis.com (en lo sucesivo, el sitio web), en calidad de responsable del tratamiento de datos y por referencia a los derechos de los usuarios registrados en el sitio web (en adelante "Usuarios"), aprobó la presente política de privacidad en virtud de la Ley nº 67/98, de 26 de octubre y del Reglamento General sobre la Protección de Datos [Reglamento UE nº 2016/679 del Parlamento Europeo y del Consejo de 27 de abril de 2016]. PACSIS respeta íntegramente los derechos de privacidad y la protección de los datos personales de los usuarios del sitio web. Los usuarios pueden ponerse en contacto con PACSIS para obtener cualquier información relacionada con la presente política de privacidad, debiendo para el efecto utilizar los contactos disponibles en el párrafo 7.
b) Cumplimiento de obligaciones legales (artículo 6, párrafo b), de la Ley de Protección de Datos Personales y artículo 6, nº 1, párrafo c), del Reglamento (UE) nº 2016/679, de 27 de abril de 2016 para el cumplimiento de las obligaciones legales previstas por la legislación nacional y las leyes o reglamentos europeos. Planificación de Trabajo y Apoyo a Decisiones de Gestión y de Estrategias de Mercado. El suministro de datos personales para el procesamiento de los fines mencionados es opcional, pero necesario, en la medida en que el no suministro de los mismos implica la imposibilidad de registro y utilización del sitio web. El asterisco en el formulario de registro identifica los datos personales necesarios para la realización de los fines del tratamiento descrito en el párrafo 1. Por medio de un consentimiento expreso, libre e informado del usuario, algunos datos personales del usuario (nombre, apellido, e-mail, dirección y número de teléfono fijo y móvil) también pueden ser tratados por PACSIS para fines de marketing (ventas directas, envío de material promocional y comunicación comercial) o para que PACSIS pueda contactar al Usuario a través de e-mail para sugerir la adquisición de productos y/o servicios ofrecidos por PACSIS y/o por terceros, presentar ofertas, promociones u oportunidades comerciales. El consentimiento para el tratamiento de datos con tales propósitos es libre y opcional. En caso de que se haya dado el consentimiento, el Usuario podrá revocar el mismo en cualquier momento mediante comunicación a PACSIS, debiendo para los debidos efectos utilizar los métodos especificados en el párrafo 7 de la presente política. El Usuario podrá también ejercer el derecho de oposición al envío de comunicaciones comerciales (por e-mail) haciendo clic en la conexión específica para revocación del consentimiento, la cual se encuentra incluida en todos los e-mails de marketing. En caso de que el consentimiento haya sido revocado, PACSIS podrá remitir un e-mail al Usuario para confirmar la efectiva revocación del consentimiento. PACSIS por la presente informa que, tras el ejercicio del derecho de oposición al envío de comunicaciones comerciales, el Usuario podrá seguir recibiendo mensajes de marketing por cuestiones técnicas (por ejemplo, mensajes de marketing elaborados poco antes del ejercicio del derecho de oposición). Si el usuario sigue recibiendo comunicaciones de marketing transcurridas 72 horas del ejercicio del derecho de oposición, PACSIS solicita que la situación se informe de inmediato, utilizando para ello los contactos especificados en el párrafo 7 de la presente política. El tratamiento de datos personales de los usuarios se ejecutará automatizada y manualmente por instrumentos informáticos, aplicando lógicas estrictamente relacionadas con las finalidades y, en cualquier caso, garantizando la seguridad y confidencialidad de los datos personales. Los empleados de PACSIS nombrados para gestionar los datos personales podrán acceder a los datos personales de los Usuarios. Los referidos empleados, nombrados por PACSIS como "personas responsables del tratamiento" tratarán los datos personales de los Usuarios exclusivamente para los fines especificados en virtud de la presente política y en estricto cumplimiento de la Ley de Protección de Datos Personales y Reglamento (UE) nº 2016/679, de 27 de abril de 2016. Los terceros que puedan tratar datos personales en nombre de PACSIS, también podrán acceder a los datos personales de los Usuarios en calidad de subcontratistas, incluidos, sin limitación, los proveedores de servicios de IT necesarios para el funcionamiento del sitio web, proveedores de servicios de outsourcing o de servicios de cloud computing, profesionales y consultores, o plataformas responsables por el envío de e-mails de marketing en nombre de PACSIS. PACSIS podrá compartir sus datos con entidades terceras para la realización de iniciativas de marketing y publicidad, garantizando que todas las entidades de terceros involucradas en el proceso de tratamiento de datos se comprometen a cumplir y respetar lo dispuesto en la Ley de Protección de Datos Personales y Reglamento (UE) nº 2016/679, de 27 de abril de 2016. Informamos que, en cumplimiento de obligaciones legales y/o contractuales, los datos personales también pueden ser transmitidos a autoridades judiciales, administrativas, de supervisión o regulatorias, así como a entidades que realizan, lícitamente, acciones de recopilación de datos, acciones de prevención y combate al fraude, estudios de mercado o estadísticos. Los Usuarios tienen el derecho de obtener una lista completa y actualizada de los subcontratistas (en caso de existir) nombrados por PACSIS, debiendo para ese efecto remitir una solicitud específica a PACSIS en los términos especificados en el párrafo 7 de la presente política. En virtud del artículo 10 de la Ley 67/98, de 26 de octubre y del artículo 12 del Reglamento (UE) nº 2016/679, de 27 de abril de 2016, PACSIS informa que los usuarios tienen derecho a obtener información sobre (i) identidad del responsable del tratamiento y, en su caso, de su representante; (ii) las finalidades del tratamiento, (iii) los destinatarios o categorías de destinatarios de los datos, (iv) el carácter facultativo u obligatorio de la respuesta, así como las posibles consecuencias de no responder, y (v) la existencia y las condiciones derecho de acceso y rectificación, siempre que sean necesarias, teniendo en cuenta las circunstancias específicas de la recogida de datos, para garantizar a su titular un trato leal de los mismos. PACSIS informa además a los titulares de los datos que los mismos tienen el derecho: a) de actualizar, rectificar o, cuando haya interés, requerir la integración de datos; b) la supresión, anonimizado o bloqueo de datos personales que hayan sido procesados lícitamente, incluidos los datos personales cuya retención no sea necesaria para los fines para los que haya sido recogida y consecuentemente tratada; c) a la certificación de que las operaciones efectuadas de acuerdo con las letras a) y b) hayan sido notificadas, así como relacionadas con su contenido, a las entidades a las que se hayan comunicado o divulgado los datos, a menos que este requisito se revele imposible o implica un esfuerzo manifiestamente desproporcionado en comparación con el derecho que debe protegerse. Los Usuarios tienen derecho a oponerse total o parcialmente: a) por razones legítimas, al tratamiento de sus datos personales, aunque sean pertinentes para la recogida; b) al tratamiento de datos personales para el envío de materiales promocionales, venta directa o realización de investigaciones de Mercado o de comunicación comercial. Para garantizar la seguridad y la confidencialidad de los datos personales recogidos en línea por PACSIS, ésta utilizará bases de datos protegidas, entre otros, firewalls adecuados y contraseñas, de acuerdo con las disposiciones de la Ley de Protección de Datos y en los demás términos legales. El acceso a los datos personales sólo es posible a los empleados autorizados que tengan una necesidad efectiva de utilizar los datos y que se han preparado para manejar estos datos de forma adecuada, de acuerdo con los principios de seguridad y confidencialidad. Las violaciones a la Política de Privacidad por empleados de PACSIS pueden dar lugar a una acción disciplinaria. El cumplimiento de las normas y procedimientos del equipo de PACSIS se supervisa y se verifica periódicamente. Aunque PACSIS no puede excluir completamente la posibilidad de pérdida, uso fraudulento o alteración de datos, pretende con estas medidas evitar tales efectos adversos. Los Usuarios podrán ejercer sus derechos mediante contacto con PACSIS a través de los siguientes métodos: i) envío de una carta certificada con aviso de recibo para la dirección indicada de PACSIS, ii) envío de correo electrónico al buzón de apoyo.cliente@pacsis.com. 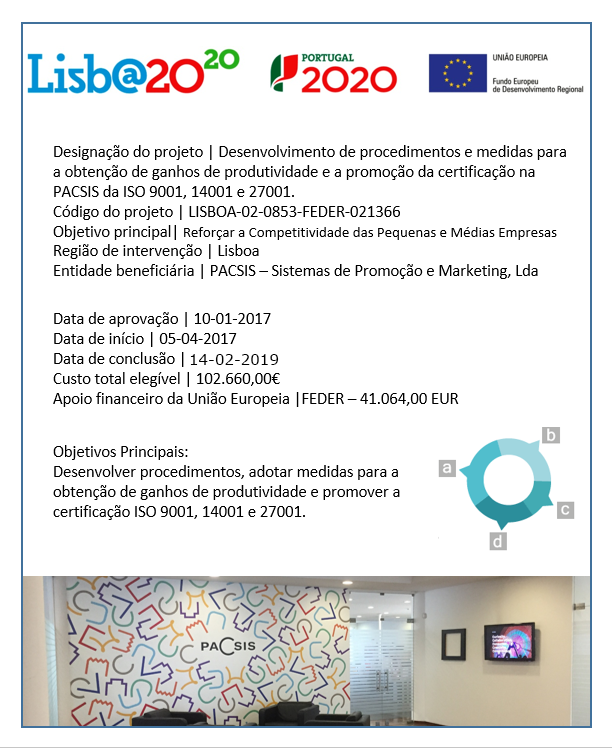 A PACSIS – Sistemas de Promoção e Marketing Lda. sociedade com sede em Estrada Nacional nº. 6, lote 107, 1º Esq.º Alfragide, 2610-171 Amadora com o número fiscal e de pessoa coletiva 502.571.985 (doravante "PACSIS"), responsável pelo website www.pacsis.com (doravante o "website"), na qualidade de responsável pelo tratamento de dados e por referência aos direitos dos utilizadores registados no website (doravante “Utilizadores”), aprovou a presente política de privacidade nos termos da Lei n.º 67/98, de 26 de Outubro e do Regulamento Geral sobre a Proteção de Dados [Regulamento UE n.º 2016/679 do Parlamento Europeu e do Conselho de 27 de abril de 2016]. A PACSIS respeita integralmente os direitos de privacidade e a proteção dos dados pessoais dos utilizadores do website. Os utilizadores poderão contactar a PACSIS para obter qualquer informação relacionada com a presente política de privacidade, devendo para o efeito utilizar os contactos disponibilizados no parágrafo 7.
b) Cumprimento de obrigações legais (artigo 6º, alínea b) da Lei da Proteção de Dados Pessoais e artigo 6º, n.º 1, alínea c) do Regulamento (UE) n.º 2016/679, de 27 de abril de 2016), para cumprimento de obrigações legais previstas na lei nacional e leis ou regulamentos Europeus. Planeamento de Trabalho e Apoio a Decisões de Gestão e de Estratégias de Mercado. O fornecimento de dados pessoais para o processamento das finalidades mencionadas é opcional, mas necessário, na medida em que o não fornecimento dos mesmos implica a impossibilidade de registo e utilização do website. O asterisco no formulário de registo identifica os dados pessoais necessários para a execução das finalidades do tratamento descrito no parágrafo 1. Mediante consentimento expresso, livre e informado do utilizador, alguns dados pessoais do utilizador (nome, apelido, e-mail, morada e número de telefone fixo e móvel) poderão também ser tratados pela PACSIS para finalidades de marketing (vendas diretas, envio de material promocional e comunicação comercial) ou para que a PACSIS possa contactar o Utilizador através de e-mail para sugerir a aquisição de produtos e/ou serviços oferecidos pela PACSIS e/ou por terceiros, apresentar ofertas, promoções ou oportunidades comerciais. O consentimento para o tratamento de dados com tais finalidades é livre e opcional. Caso o consentimento tenha sido dado, o Utilizador poderá revogar o mesmo a qualquer momento através de comunicação à PACSIS, devendo para os devidos efeitos utilizar os métodos especificados no parágrafo 7 da presente política. O Utilizador poderá também exercer o direito de oposição ao envio de comunicações comerciais (por e-mail) clicando na ligação específica para revogação do consentimento, a qual se encontra incluída em todos os e-mails de marketing. Caso o consentimento tenha sido revogado, a PACSIS poderá remeter um e-mail ao Utilizador para confirmar a efetiva revogação do consentimento. A PACSIS pela presente informa que, na sequência do exercício do direito de oposição ao envio de comunicações comerciais, o Utilizador poderá continuar a receber mensagens de marketing por questões técnicas (por exemplo, mensagens de marketing elaboradas pouco antes do exercício do direito de oposição). Caso o Utilizador continue a receber comunicações de marketing decorridas 72 horas do exercício do direito de oposição, a PACSIS solicita que a situação seja de imediato reportada, utilizando para o efeito os contactos especificados no parágrafo 7 da presente política. O tratamento de dados pessoais dos utilizadores será executado automatizada e manualmente por instrumentos informáticos, aplicando lógicas estritamente relacionadas com as finalidades e, em qualquer caso, garantindo a segurança e confidencialidade dos dados pessoais. Os colaboradores da PACSIS nomeados para gerir os dados pessoais poderão aceder aos dados pessoais dos Utilizadores. Os referidos colaboradores, nomeados pela PACSIS como “pessoas responsáveis pelo tratamento” tratarão os dados pessoais dos Utilizadores exclusivamente para os fins especificados nos termos da presente política e em estrito cumprimento da Lei da Proteção de Dados Pessoais e Regulamento (UE) n.º 2016/679, de 27 de abril de 2016. Os terceiros que possam tratar dados pessoais em nome da PACSIS, poderão igualmente aceder aos dados pessoais dos Utilizadores na qualidade de subcontratantes, como sejam, incluindo, sem limitar, os prestadores de serviços de TI necessárias ao funcionamento do website, prestadores de serviços de outsourcing ou de serviços de cloud computing, profissionais e consultores, ou plataformas responsáveis pelo envio de e-mails de marketing em nome da PACSIS. A PACSIS poderá partilhar os seus dados com entidades terceiras para a realização de iniciativas de marketing e publicidade, garantindo que todas as entidades terceiras envolvidas no processo de tratamento de dados se comprometem a cumprir e respeitar o disposto na Lei de Proteção de Dados Pessoais e Regulamento (UE) n.º 2016/679, de 27 de abril de 2016. Informamos que, em cumprimento de obrigações legais e/ou contratuais, os dados pessoais poderão também ser transmitidos a autoridades judiciais, administrativas, de supervisão ou regulatórias e ainda a entidades que realizem, licitamente, ações de compilação de dados, ações de prevenção e combate à fraude, estudos de mercado ou estatísticos. Os Utilizadores têm o direito de obter uma lista completa e atualizada dos subcontratantes (caso existam) nomeados pela PACSIS, devendo para o efeito remeter um pedido específico à PACSIS nos termos especificados no parágrafo 7 da presente política. Nos termos do artigo 10º da Lei 67/98, de 26 de Outubro e artigo 12º do Regulamento (UE) n.º 2016/679, de 27 de abril de 2016, a PACSIS informa que os utilizadores têm o direito de obter informações sobre (i) identidade do responsável pelo tratamento e, se for caso disso, do seu representante; (ii) as finalidades do tratamento, (iii) os destinatários ou categorias de destinatários dos dados, (iv) o carácter facultativo ou obrigatório da resposta, bem como as possíveis consequências de não responder, e (v) a existência e as condições do direito de acesso e de retificação, desde que sejam necessárias, tendo em conta as circunstâncias específicas da recolha dos dados, para garantir ao seu titular um tratamento leal dos mesmos. A PACSIS informa ainda os titulares dos dados que os mesmos têm o direito: a) de atualizar, retificar ou, quando houver interesse, a requerer a integração de dados; b) ao apagamento, anonimização ou bloqueio de dados pessoais que tenham sido processados ilicitamente, incluindo dados pessoais cuja retenção não seja necessária para os fins para os quais tenha sido recolhida e consequentemente tratada; c) à certificação de que as operações efetuadas de acordo com as letras a) e b) tenham sido notificadas, como também relacionadas ao seu conteúdo, às entidades a quem ou às quais os dados foram comunicados ou divulgados, a menos que este requisito se revele impossível ou envolva um esforço manifestamente desproporcional em comparação com o direito que deve ser protegido. Os Utilizadores têm o direito de oposição, no todo ou em parte: a) por razões legítimas, ao tratamento dos seus dados pessoais, ainda que os mesmos sejam relevantes para os fins da recolha; b) ao tratamento de dados pessoais para fins de envio de materiais promocionais, venda direta ou realização de pesquisas de Mercado ou de comunicação comercial. Para garantir a segurança e a confidencialidade dos dados pessoais recolhidos online pela PACSIS, esta utilizará bases de dados protegidas, entre outros, firewalls adequados e palavras passe, de acordo com as disposições da Lei de Proteção de Dados e nos demais termos legais. O acesso aos dados pessoais só é possível aos funcionários autorizados que tenham uma necessidade efetiva de usar os dados e que foram preparados para lidar com estes dados de forma adequada, de acordo com os princípios da segurança e confidencialidade. As violações à Política de Privacidade por funcionários da PACSIS poderão dar origem a ação disciplinar. A conformidade com as normas e procedimentos pela equipa da PACSIS é monitorizada e verificada periodicamente. Embora a PACSIS não possa excluir completamente a possibilidade de perda, uso fraudulento ou alteração de dados, pretende com estas medidas evitar tais efeitos adversos.